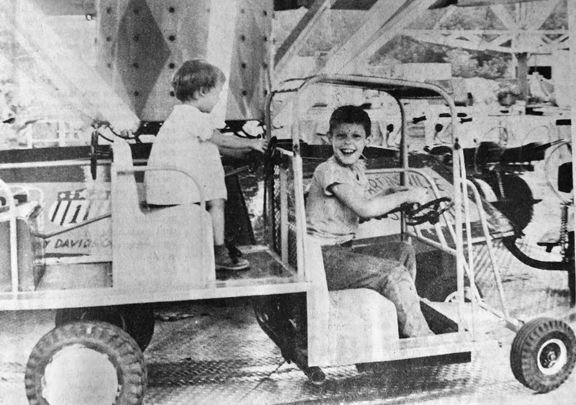 Thirty-seven years ago this week, 2-year-old Wendy Tipton (left) and her brother Jackie, children of Mr. and Mrs. Jackie Tipton Sr. of Marion, had a great time at the Marion Jaycee’s Fun Fair at the McDowell Saddle and Bridle Club Showgrounds on N.C. 226 South. 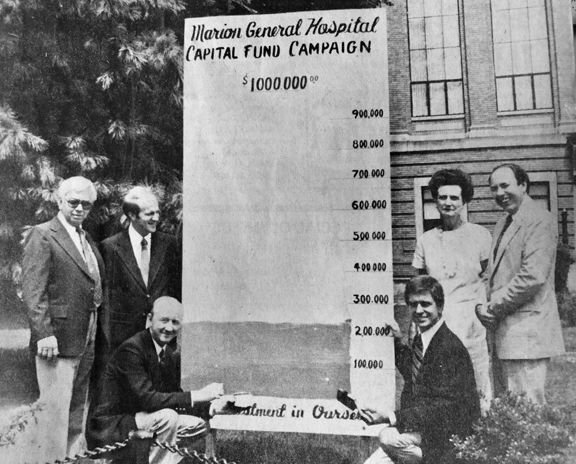 During the week of Aug. 12, 1981, John Cross (kneeling, right), chairman of the Marion General Hospital Capital Fund Campaign, reported that his division had raised 35.1 percent of its goal, $246,200. That total represented 24.6 percent of the total campaign goal of $1 million needed for the construction of a new hospital for McDowell County. Shown with Cross in front of the courthouse were Ed Ghent (kneeling, left), general chairman of the campaign; and (standing, left to right) Ed Rankin, chairman of the Hospital Board of Trustees; Steve Little, chairman of the In-Family Division; Doris Hill, chairwoman of the Major Gifts Division; and Roger Cothran, chairman of the Campaign Steering Committee. Thirty-seven years ago this week, Beth Gardner (left) captured the gold medal in the Girls 14-Under Singles Division and Beth Young took the bronze medal in the Morganton-Burke Tennis Tournament. Gardner advances to the finals by edging Young in a three-set match and beating her Hildebran opponent, 7-3, 6-5. Young won the consolation match by blanking Morganton’s Tammy Greene, 6-0, 6-0. Both McDowell County girls were rising ninth-graders with Gardner at West Junior High and Young at East Junior High. During the week of Aug. 12, 1981, local, state and federal law enforcement authorities broke up one of the largest liquor stills in western North Carolina. This was a result of a two-month investigation by the McDowell County Sheriff’s Office. The still was found off Highway 9 near the Buncombe-McDowell county line. In this picture, Kip Aldridge, a state alcohol law enforcement agent, helps bust up the moonshine still. Thirty-seven years ago this week, almost 300 disabled people from Burke, Caldwell and McDowell counties attended the first annual Special Day for Special People at the Marion Moose Lodge. The activities included an egg race, swimming, music and dancing, relay races, musical chairs and other fun-filled games. In this photo, participants anxiously awaited the start of the wheelchair race. During the week of Aug. 12, 1981, around 60 McDowell girls and boys attended the NJROTC boot camp, which allowed them to get a jump on the upcoming year. The training exercises were conducted by an upper classmen and in this photo, sophomore girls are learning the fundamentals of drilling. Later in the week, the boot camp participants visited the USS North Carolina in Wilmington. During the week of Aug. 12, 1981, the McDowell High Titans outscored Chesnee High in a scrimmage game, which was considered to be a part of a high school team’s preseason learning process. In this photo, three Titan defenders converge on grabbing the football. They were Chris Ledbetter (71), Joey Ledford (75) and Mike Freeman (34). Thirty-seven years ago this week, The McDowell News showed its support for the Titans as they got ready for the 1981 football season. During the week of Aug. 12, 1981, Titan players Neil Brackett (left) and Tommy Winchester take a look at the 1981 football schedule. The opening game was set for Aug. 28 on the road against Chase High School. During the week of Aug. 12, 1981, Woodsy the Owl was on hand at the McDowell County Public Library during the summer reading program. Woodsy was there to entertain the children and educate them about the bad effects of pollution. The program had approximately 400 participants at the Marion and Old Fort branches.